Bad news. Your pullups might be letting you down when it comes to building strength and size. Here’s how to fix them. and strength. But just because you’ve been doing them since P.E. doesn’t mean your mechanics are on point. Here are the five most common pullup mistakes and how to avoid them. half-rep pullups that reduce your muscle’s time-under-tension and allows more biceps activation. The dead hang is a reset that pre-engag- es your lats before pulling. Add even more difficulty by including a one-second pause at the bottom. Before you begin, lower your shoulders, raise your rib cage, and elongate your neck. Doing so puts your body in an advantageous mechanical position that allows for better target muscle activation. Failing to pre-engage the lats will result in more help from your arms and shoulders. Pullups vs. Chinup: Chinups place more emphasis on the bi’s, rhomboids, and inner lats. Alternate them with pullups weekly for complete back development. Stop being such a stiff. Arching your back enables the spine to extend and allows your thoracic region to open up. This forces your shoulder blades together and recruits more of your upper back. We often advise that your chin should pass the bar at the apex of the movement, but that might not work for your body. It’s OK if you feel a peak contraction when your eyes or nose reach bar height rather than your head or neck. Discover when you feel the contraction and use that as your benchmark for all of your reps.
is an easy way to do more reps without fully activating your back muscles, but you risk damaging your shoulder joints as a result of the constant swinging. This has no carryover to your strict pullup. For the best results, stick to the basic pullup and execute each rep with control. 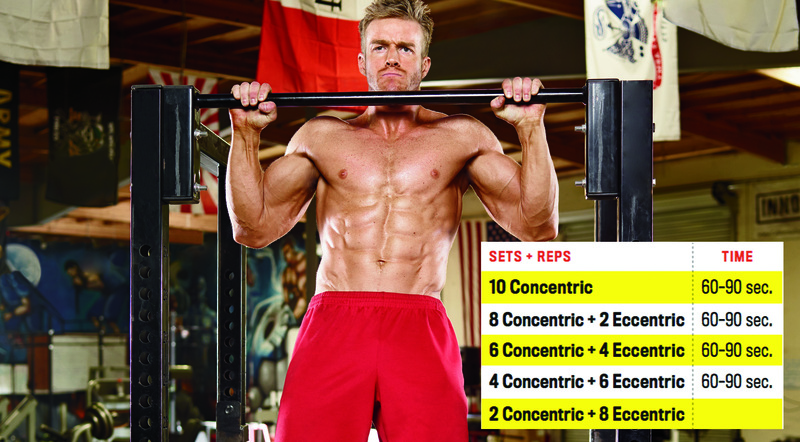 The Reverse Ladder Pullup: Total 10 pullups per set using a combination of positive (concentric) reps and negative (eccentric) reps. To perform an eccentric rep, assist yourself (using a box or step) to the top position, or just jump up. Then slowly lower yourself to a dead hang. Aim for a five-second descent. If you can, complete two rounds.